Mega Jackpots Wolf Run Slots is a classic video slot game powered by IGT and is loved by all for its aesthetic theme, along with the added excitement of winning a mega jackpot at stake. Play the all-new Wolf Run Mega Jackpots Slots game at Casino UK mobile casino and spin the reel for a potentially life-changing win. Play Wolf Run Slots Mega Jackpot Free Demo At Casino UK Mobile Casino – Play Now! If you are new to the game and would like to make a try for free, make use of the demo mode of the Mega Jackpots Wolf Run Slots. This will help you explore the game, its theme and enable you to be well-prepared when you engage in a real bet. Play Slot games for free at Casino UK, till you decide to make a deposit. IGT is one of the iconic names in the slot machine world and this slot maker’s most popular creation is the Wolf Run Slots, a game that belongs to the IGT Game Studio’s Mega Jackpots suite. This 5 reel video slot game comes with 40 pay lines and is really easy to play. 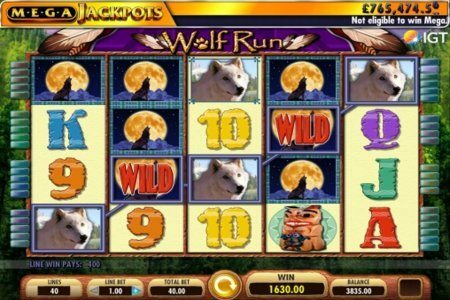 Based on the enigmatic theme and power of the Wolf, the Mega Jackpots Wolf Run Slots consists of 3 symbols – pure white wolf, dark grey wolf and a lone howling wolf. It is also inspired by the tribal theme of Native American reserves and features symbols depicting such figurines. Get your hands on the progressive jackpot that is part of the game. If lady luck is on your side, you stand a great chance to win the mega jackpot. Visit Casino UK mobile casino now and play this popular video slot game. On the whole, wolf run slots by IGT is well put together. There is plenty of action on the screen, an appealing mountain backdrop and traditional tribal music playing in the background. In terms of its graphics and sounds, it might sound a little simple and outdated, as opposed to contemporary slot machines. However, the Mega Jackpots Wolf Run Slots is a classic golden game that is liked by all mobile casino players for its simplicity. The lone howling wolf acts as the substitute for all other symbols apart from the bonus symbol. It is the most rewarding symbol and the wild symbol that has the potential to trigger multiple win lines for large prize payouts. The bonus dream catcher icon is the important symbol of Mega Jackpots Wolf Run Slots that will trigger the bonus round. If three bonus symbols appear on the reels, you will be entitled to 5 free spins. All wins during this bonus round come with a 2x multiplier. You have the potential to further re-trigger another bonus round if 3 bonus symbols appear again during your free spins bonus round. Playing with 40 pay lines and the bonus round will give you the chance to make the most of your bet and win more. At Casino UK, we like to reward our players constantly. You get a free bonus of $5 simply for registering with us. Use this free no deposit bonus to place risk-free bets on all games including the Mega Jackpots Wolf Run Slots game. If you strike to win, you can withdraw your free money wins after you satisfy the wagering requirements of the no deposit bonus. All the mobile casino games of Casino UK are available for play from your mobile. You can even make a deposit through your mobile, by using your phone credit. Simply select the pay by phone bill mode, enter your mobile number, receive an SMS, confirm your payment and get done with the deposit quickly.